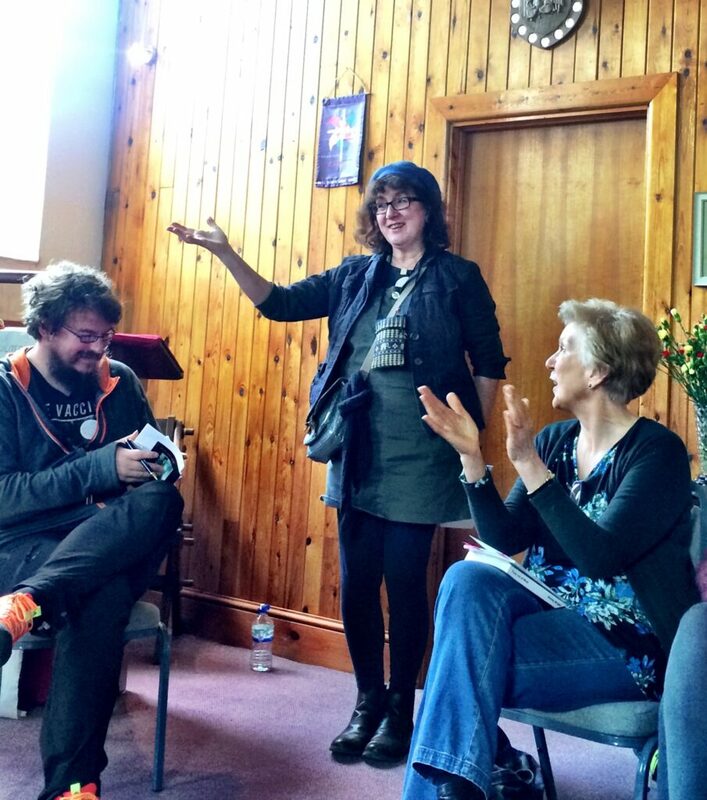 Ever thought you’d like to run a local literary event? Indie festivals are challenging the celebrity-author festival model and proving hugely popular with authors and readers. Debbie Young, the organizer of a local village festival offers top tips on how (and why) to organize your own — and do it your way. There are many reasons to found a local literature festival, and although many such events are springing up all over the place these days, each one is likely to have a different and personal history and a unique model. 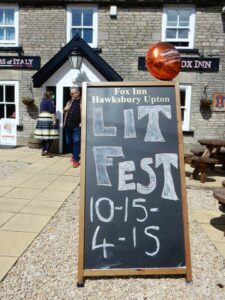 I’m here to share a case study of the Hawkesbury Upton Literature Festival (HULF), a successful small indie festival I founded three years ago, to inspire and encourage others to create their own. I’ll be writing a more detailed account in a book in due course, but this post should give you a good idea of how it came together, why it worked, and why, three years on from its foundation, it’s now a regular and much-loved highlight of my local community’s social calendar. If you have any questions, I’ll be happy to help you as much as I can. As well as being an indie author, I used to work for the national British children’s reading charity Readathon, which encourages children and young people to embrace a love of reading, because a habit of reading for pleasure is proven to have enormous impact on an individual’s success in life, not just academically or career-wise, but also in terms of personal relationships and social life. While working for Readathon, I learned about World Book Night, which takes place on UNESCO’s International Day of the Book (23 April), and which aims to do something similar for adults, too many of whom abandon reading as they grow up, and so miss out on its many benefits and comforts. 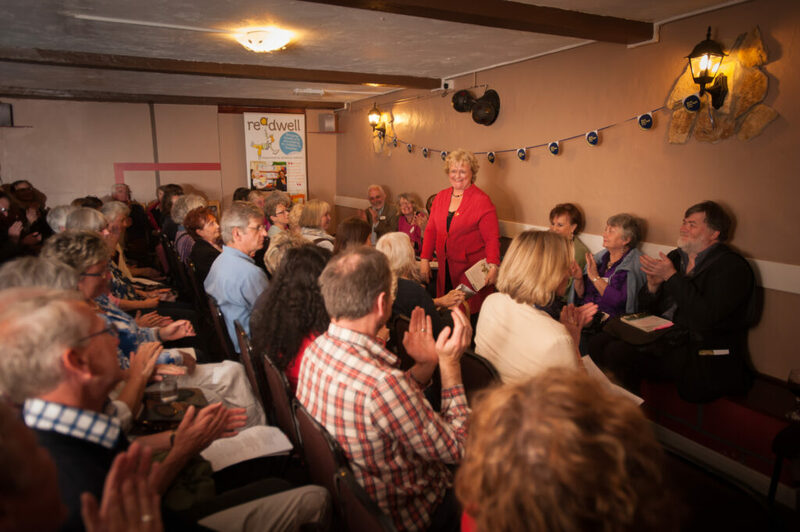 Living in a relatively isolated village in the south west of England with no bookshop or library, I wanted to create a World Book Night (WBN) celebration for this close-knit and lively community of about 1500 people. In keeping with the theme of WBN, I wanted it to be accessible and appealing to all social groups (our village has a cross-section from poor people living on benefits to millionaires), and also not to be offputting to those who aren’t already regular readers. 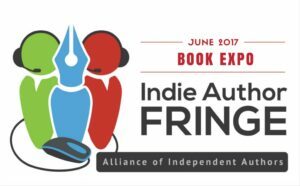 At the same time, I wanted to offer new opportunities for indie authors to take centre stage in a litfest setting – something that I knew was generally denied to them from having co-authored ALLi’s guidebook Opening Up to Indie Authors. I therefore set it up as a night in one of our two village pubs, with free admission, and a lively, fast-moving programme of talks and readings by indie authors that I already knew. Unlike commercial festivals, it would not focus on any individual author (or their publisher’s PR plans), but would hone in what made readers tick. 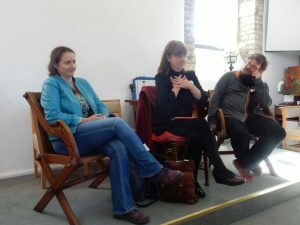 For those who had never shared their work in public before or who had been unable to secure a booking from any other festival, they welcomed the chance to add “as featured at Hawkesbury Upton Literature Festival” to their writers’ CV. My village has an effective grapevine for publicising local events, and it’s all pretty low-budget and low-tech – notices in the monthly parish magazine, posters in the village shop and on every telegraph pole in the village – but I also set up a website and shared it on social media. I recruited a couple of locals to help marshall people, hired a photographer friend to capture it for posterity using a grant I’d successfully applied for from our nearest supermarket with a community action policy, blagged free photocopying for programmes, and benefited from a small grant for refreshments from our local writers’ group (of which I’m a member), which farms its profits from its self-published books about the village history into community causes. Clearly I’d struck a successful formula and the germ of an event that could grow as large as I cared to make it. This year, the audience were pressing me to turn it into a two or three day event, which would be the natural next step, but I’m not ready to make that commitment just yet, and also don’t want to dilute the buzz. It would also change the nature of the event, requiring the formation of a committee, regular meetings year-round, and an even larger amount of work for me that would be too distracting from my own writing. The only audience complaint? “I want to go to everything – there’s just too much choice!” Which I reckon is a good problem to have! Yes, it’s a lot of work and a big responsibility, and I’m exhausted for weeks before and afterwards, but it’s one of my proudest achievements, and having seen so many fruitful new relationships built between authors and readers, it’s one I’m happy to repeat year after year. My festival, my rules! And as Dan Holloway (and HULF author for the last two years) said after this year’s festival, “It’s amazing what can be achieved when you break the rules”. Clearly I could talk about HULF all day and all night, but if you want to find out more about it, you can check out its website: www.hulitfest.com. Think about what might interest your audience and plan around that rather than around what the authors might choose! Welcome audience participation – I’ve just introduced a “Poetry Please” session for audience to bring their favourite poems along to read, and we also have free writing workshops. 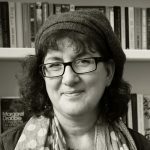 Book the authors as far in advance as you can, and have a deadline beyond which you will say no to all comers – my cut-off is December for an April festival, so that I can concentrate on publicising the actual programme January-April. Only book authors that you know personally and have met – that may seem a restriction, but it comes from experience! People who sound good online or on paper aren’t necessarily great at performing in public. If someone you don’t know is eager to come, tell them to come to the next festival as a member of the audience, and to come to meet you. If they can’t be bothered, they don’t deserve a place anyway! Give them a clear brief as to what is required of them, in writing. Encourage panel chairs to liaise with their panels in advance so they’re not meeting as strangers on the day of the festival. Give your chairs a degree of freedom within your guidelines – they will think of things you wouldn’t and bring their own personal value to the event. Treat all authors the same way – e.g. one event per person, no-one is allowed to break or bend the rules. There will be some who insist the three-minute rule isn’t right for them, or that they really want to do a talk all on their own. Those are alarm bells ringing, so repeat your mantra: your festival, your rules. If they don’t like them, they can invent their own festival. When you’ve made the rules clear from the outset, though, that shouldn’t be a problem. Although we’re talking about indie festivals away from the commercial norm, this doesn’t mean trade-published authors are taboo. Invite whoever you think will work for you – though don’t assume that just because some has a traditional publishing contract, they’ll be any better before an audience than indies – they may be less used to doing events than you are and less self-sufficient and self-reliant than the average indie. Your choice will probably be limited by your funding. I started off using a local pub, the Fox Inn, and could never have launched HULF without their goodwill and support. Start small with venues you are confident of filling, and expand as your festival grows. We’ve added a venue each year and each one has been full (Methodist Chapel in 2016, Bethesda Chapel in 2017). Next year I might add the village school hall or the Village Hall, and St Mary’s parish church is also an option. We”re a bit spoilt for choice where I live! Venues don’t have to be conventional event centres such as theatres or conference halls. We use a pub, two chapels, and the hall behind one of the chapels, plus a tent. These are all fun, quirky and welcoming, and add to the friendly, homely feel of the event. If you’re using small, underused venues, you can negotiate a good deal by pointing out the benefits of having a big audience stepping inside them for a day, possibly leading to extra bookings. Many small venues are managed on a shoe-string by volunteers, and you may be able to pay them at least partly in kind. For example, I’ve been planting out the small flowerbeds in front of the Methodist Chapel, have donated curtains and lighting for one of their small anterooms, and framed calligraphies that my dad has done of religious texts. It’s cost me next to nothing, helped build the relationship long term, and also given me enormous personal satisfaction. Your festival is nothing without an audience, so aim to please yours and make them feel this is their festival, as well as the authors’. Ensure comfortable seating, lighting, sound (use microphones if you can and assume a certain percentage of your audience will be hearing impaired). Provide comfortable turnaround times between events – I have 50-minute events starting on the hour every hour, so there are ten minutes from them to move between venues, which are a couple of minutes walk apart. Ensure your authors keep to the timetable – all parties will be much more relaxed if no-one has to rush or leave an overrunning event to catch the next on their list. Provide clear directional signage – not everyone in your audience will know their way round your locale. Provide printed programmes on the day – they needn’t be fancy, just an agenda so they know where to go when. Recruit volunteer marshalls and give them clear badges so people know who to ask if they’re lost or confused. Brief those marshalls so they know what’s what! Respect your audience – they are your festival’s unofficial ambassadors and you want them to tell everyone afterwards how great it was and persuade them to come next time! If you have local authors, or others who might serve as panel chairs, involve them – their local friends will come to see them and stay for at least part of the rest of the festival, and it also builds the feeling that this is truly a local festival. Promote the event in the most likely places to reach your audience. If it’s a small local community like mine, this doesn’t mean taking out paid ads or staging a busy social media campaign. Your local paper, library, tourist office or school may be more appropriate than something with global reach. However, you must have a website, even if it’s only simple – online is where most people will look. Facebook events and Twitter profiles are useful but beware of taking on more than you can do – or else appoint a committee of volunteers each tasked with a key component of your publicity campaign. Encourage authors to speak to the audience – they love meeting “real” authors, even those they haven’t heard of. My mum was so touched when author Celia Boyd thanked her for buying one of her books, having spotted it by her cup of tea in the cafe, that when my mum got home, she ordered the rest of Celia’s books from Amazon! Finally, word of mouth is the best recommendation, and ask them to tell their friends if they’ve enjoyed it. 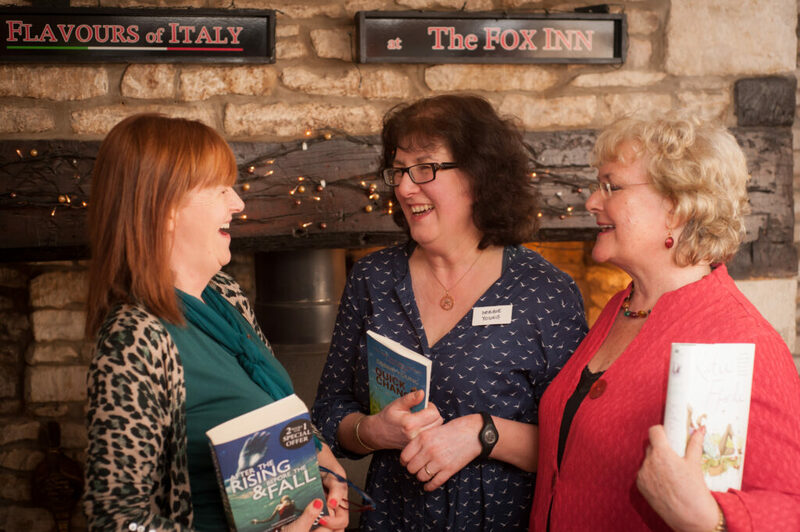 Authors and guests enjoying the first Hawkesbury Upton World Book Night Festival at The Foxx Inn, Hawkesbury Upton. Most festivals will be annual, and a year is a long time to keep the momentum going, so try to do something each month to keep your festival in the public eye. I also tell myself “Festival Friday” so that i at least think of it once a week, even if I don’t do anything about it! If there are other events going on in your locale, try to muscle in on their audience e.g. by taking a stall at a village fete or school fair. HULF now has a stall at the Hawkesbury Horticultural Show each August manned by half a dozen authors to promote the Festival while also selling their books. Update your website throughout the year (also on my to-do list is to add the photos and videos from this year’s event). Mention it in your CV and at every opportunity. I’m lucky enough to be part of a monthy Book Club slot on BBC Radio Gloucestershire’s lunchtime show, and the presenter always introduces me as “local author and director of the Hawkesbury Upton Literature Festival”! Be on the look-out for new talent all year round – you will certainly meet new authors who will give you ideas for new events. For the first festival, I self-published an anthology featuring a short piece by each author. This has been useful to demonstrate the breadth of the festival to people who haven’t been there, but although useful for PR purposes, it hasn’t sold many copies so I haven’t done it for the last two events. Decide from the outset whether you are going to make this a free event or a chargeable one. If charging for admission, you should pay your author speakers a fee. Selling tickets is likely to diminish attendance – we have many people who go to multiple events or try events they’re not sure they’ll like, because there’s no cost implication. Selling tickets and paying authors also provides an administrative responsibility and burden – appoint a trustworthy volunteer to manage that if you can, or it’ll be a distraction. Even if you’re running a free festival, set up a bank account, which will make it clear you are above board, and will also make you eligible for grants. We’ve only done that this year because last year we missed out on a grant from a local family’s trust fund, which was a shame. Grants for small festivals are available if you look for them – and not only from literary funds. Our local supermarket Waitrose has twice made HULF a beneficiary of its “community matters” token scheme, giving us about £300 each time, covering facilities hire. You don’t have to spend a lot to make a festival happen. Call in favours and talents. When I needed a local image to promote the festival, my dad kindly painted a watercolour of the monument that is the icon of our village. Handwrite your signs – if they’re a bit wonky (mea culpa), it just adds to the indie feel of the event. Source cheap things online – our author and volunteer badges are really popular, and the recipients are proud to wear them as acknowledgement of their status, which helps build goodwill and engage their continuing support. an easy launch platform for my books – I claimed organiser’s perks this year and gave a shout-out for the first novel in my new Sophie Sayers Village Mysteries series, Best Murder in Show, which is set in a small English village not unlike Hawkesbury Upton featuring an aspiring writer and a local independent bookseller… I am surely going to have to write a lit fest into a future book in that series, and can consider my research already done! For more information about the #PublishingOpenUp campaign, read ALLi’s guidebook, Opening Up to Indie Authors. Enter to win a signed paperback copy of Debbie Young’s fun cozy mystery Best Murder in Show, in which the central characters include an aspiring writer and an independent bookseller. Helpful info for those of us who live in small towns far from a big city in the US. Like the idea of piggybacking on WBN. Thanks, Janet, and so glad you found it useful. I reckon you can’t lose much by giving it a try in your own town as the financial outlay is minimal – it’s just a question of how much time and energy you are ready to invest. And there is much joy to be had in tailoring it for your own small town – one of the highlights for me of my 2017 Festival was having a local author give a reading from his book about the names commemorated village war memorial, standing right next to the memorial itself – something he’d never done before and much appreciated by the local community. Great article. The idea of pulling together a festival is daunting, but the start small with a couple of speakers and build momentum is genius to create awareness in your local town. It is definitely something that I will consider as my local area has nothing dedicated outside of the library for author driven or encouraged events. Thank you for the step-by-step layout. It’s a pleasure, Janice, and i’m glad to be able to share this model with others who can put it to good use around the world. I’m planning to write a short book with more detail soon, as there is much more I’d love to tell you about it! Good luck with planning an event for your area, and if you have any questions, please don’t hesitate to message me via my Festival website – I’ll be happy to advise.